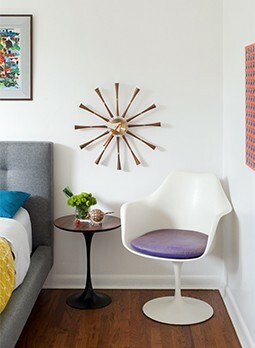 The couple—she runs a safety consulting firm and Paul is a design consultant—started collecting midcentury pieces six months before moving to their home, transitioning from Arts and Crafts to modern pieces. They kept some items in storage while they waited for the right Cliff May ranch house to come on the market and when it did, they were ready to move right in. Windows may make the house, but midcentury collectibles make the home. Stay tuned for Part 3 to learn about the Days’ collections, from surfboards to a ’63 Shasta trailer.